I love the blue dress. Nice set. Le borse!!! Le voglio entrambe!!!! :) buon week tesoro! Mi fanno impazzire i due abiti! Voglio trovarli, sono splendidi! Buon we cara! Anch'io ho sempre amato lo stile nautico, mi ricorda Audrey, BB e Portofino. Che belli questi set, indosserei tutto! ciao cara! a te starebbe benissimo lo stile nautical ma a me farebbe sembrare le curve generose...davvero troppo abbondanti...effetto optical delle righe orizzontali!!!! So classy. Love the dress and bag! Have a great day! ...Thx for sharing..:-) Many kisses! Have a great weekend dear Lilli!!! Hi Lilli, I adore nautical style, my favourite print is stripes, and I would wear both these fabulously styled looks in a heartbeat. Thanks so much for your kind visit. Have a wonderful warm weekend! uno degli stili che amo di più! Bellissimo soprattutto quelle con l'abito a righe blu! Buon week end anche a te! Bellissimo l'abitino a righe bianco/blu!! le righe mi sono sempre piaciute e lo stile nautical è da sempre uno dei mie preferito, lo oso poco ma trovo sia stupendo, ha stile, carattere, raffinatezza. Le tue proposte le adoro e se potessi scegliere la versione in blu, secondo me, rende molto di più ma adoro comunque entrambe. Thank you Lilli for the great weekend inspiration! I am going to spend my weekend in the countryside and this outfit (the blue one) will be absolutely perfect for that! I have to tell you that Mango closed their store here some years ago but luckily they opened it again a few months ago. So I am going to the store and buy this beautiful blue striped dress! The aviators are a must (I need a new pair of sunglasses) and the hat is so cool! Perfect for the summer! Have a lovely weekend! Molto belle le borse, quello a righe blu è favoloso! I'm also obsessed with stripes Lilli! It got so bad that I had to stop myself from buying them for awhile :) I really like both of these pretty nautical inspired looks you put together as they are so breezy and effortless looking. I wouldn't think to wear a striped bag with a striped dress but it's so cute and you've inspired me. Have a lovely weekend sweet friend! So chic and comfy <3 Kisses :) and happy week-end, dear Lilli !!! Come ben sai Lilli adoro le righe, quindi questi abitini non possono che piacermi! Adoro quello con le righe gialle e che bello il cappellino di paglia! Buon week-end!! Wow! I love everything from your wishlist. Those striped bags are awesome!! ma pensa che io sono entrata da mango l'altro giorno e non ho visto quete borse altrimenti lei avrei comprate, mi piacciono entrambi in particolare quello di destra per via del contrasto fra rosso e blu! Adoro le righe, soprattutto d'estate, e quello blu con la borsa rossa è il mio preferito! Dear Lilli, your wish list could be my wish list. Stripes are always great, especially in the summertime. I like both of your selections, but my favorite, is the one with the blue stripes dress. The red stripes tote is also my special choise. I think red lipstick would be very pretty for this outfit. Adoro lo stile nautical! Un bacione tesoro. Lilli, stripes are my weakness. I love this dress and bag. I like wearing these type of dress during the Summer. I will check out Mango. Have a wonderful weekend. Love the pairing of different size stripes Lilli. These outfits are too cute! That is such a great style that you created! I like those stripes. Adorabili questi look "marinari", specialmente quello a destra ! Un bacione Lilli ! I like the yellow dress best, very nice for summer! Se ti va passa sul mio blog, Ti aspetto!!! Niece pieces, ideal for holidays! Lovely Summer dresses. Hope you are having a great weekend? I would love to follow you via polyvore if I know your link. Perfect. Nautical has always been a favourite of mine and I'm sure I'll love it forever. 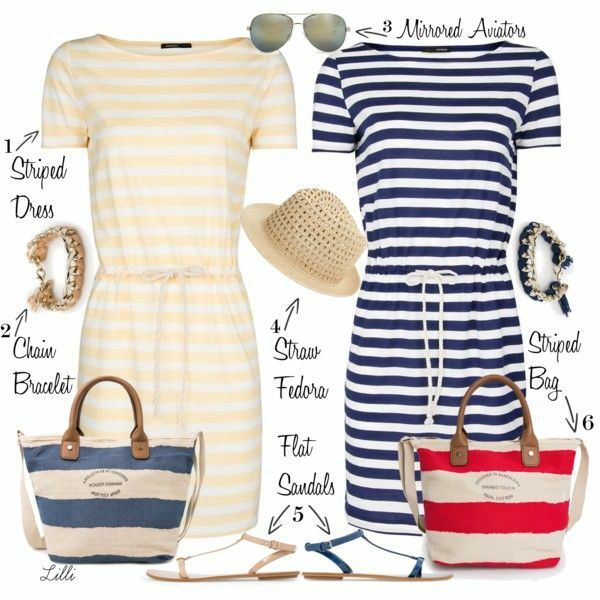 I have always liked the nautical look and stripes, perfect for summer - thanks for sharing this post. che bella l'ispirazione per questo weekend! mi piace molto, adoro questo stile, è l'ideale in questo periodo estivo! personalmente sceglierei l'abitino blu, brava ad aver scelto anche i sandali bassi! those dresses are so summery! :) lovely combination! I invite you to visit my blog and let me know if you like it. I'm following you on Bloglovin, I hope you can follow me back to stay in touch. Lilly! You know I too can not resist stripes! Though I don't think I actually own any in bag form yet - I know, I'm so bad, don't judge! I can't decide what look I'd like since I'm crushing on both the red and blue bag. Would it be weird if I walked around with both of them lol! Hey Lilli! Amazing collage, you picked such chic fashion clothing and accessories! I'm a huge fan of nautical items, I remember buying sooo much nautical jewellery, I was so obsessed with it! hehe. I love the stripes too, especially on summer dress or maxi dress.. looks so effortless! Navy and red is so famous right now, I've seen so many people rocking them for this season. =D I wish you a fantastic week ahead of you hun! Ciao Lilli. Io adoro le righe (quest'anno ho comprato un paio di espadrillas a righe bianche e blu) e di questo set mi piace tutto. Spero riuscirai a trovare tutto con i saldi...io non sono stata molto fortunata! Che belli questi navy look, mettono tanta voglia d'estate e di mare!!! Qui non si capisce più nulla, anche stamattina pioverà: cielo grigio e temperature anomale..... meno male che sono in partenza x altri terre!!!!! !